Can the mouse and keyboard kill the gamepad too? Cooler Master hopes so. 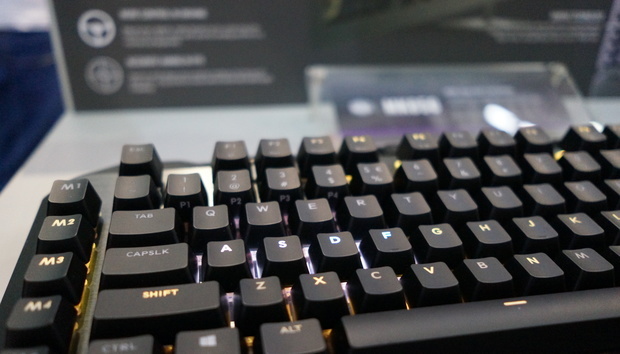 The Cooler Master MK851 will be the first keyboard introduced that supports Aimpad analog technology. Aimpad works by using an IR sensor integrated into Cherry MX switches so it can detect how hard you're pushing the keys to up to 4mm of depth. By contrast, conventional digital switches are either on, or they’re off. The Aimpad technology in the MK851 pretty much gives the keyboard the analog gradations of a joystick, which in turn lets you drive a car or fly a plane in games with the precision of a joystick. Cooler Master integrated the Aimpad technology in the WASD keys frequently used for movement in games, plus four other keys nearby. The rest of the board consists of standard Cherry MX linear switches. The reason for the limited key placement, Cooler Master says, is that few other keys need analog depth support. The keys, frankly, are also far more sensitive to debris. Get Pringles dust in your Cherry MX keyboard and it’s no big deal. Particles in the Aimpad keys could potentially gum things up big time. Cooler Master says it takes about 30 minute of use to acclimate yourself to using Aimpad technology. Pricing for the MK851 hasn't been announced yet but it should be available by the end of this summer.